The TRAINITY model focuses on fundamental aspects of good and successful training. We developed this model to ease up the process of conceptualizing, executing and reflecting on training. MOWOMIND uses the TRAINITY model for all training! The train-the-trainer sessions, in particular, have their whole structure built around this model. Good training needs to have a well thought-through mixture of knowledge transfer, the creation of new experiences and reflection on both content and the experience. This model is not linear, but variable, meaning all phases of the model can be combined in the most suitable way for you. There are many different ways to conceptualize and execute good training. Looking at it from the meta-level you can break it down into three basic aspects: Input – Exercise – Reflection. I name this combination the TRAINITY model. In this blogpost I will write about these basic and fundamental aspects for good and well balanced training. What makes good training? You will no doubt ask yourself this question when conceptualizing “train-the-trainer” programs, and hopefully even before this point. Every training session should explain why a particular topic is relevant, how you can use it for your particular use case and what you can do to improve through reflection. With this is mind, let’s go through the TRAINITY MODEL© and take a closer look at the different aspects of good training. INPUT: Inform and inspire action! When considering a training session, the person leading the training is typically more advanced in a specific field then the participants. This means that the trainer can offer knowledge, experience and guidance for the participants. This is also one of the main differences compared to workshops, in which the facilitator needs to be an expert for the process but not for the content. A highly important aspect for gathering input in such training sessions is to find a balance between a quick but less thorough approach and providing deeper insights and background on the topic. For a beginner group the trainer therefore needs to break the topic down into easy-to-understand sessions using buzzwords. Advanced participants expect only a short, basic intro to get everyone on board and then a deep (expert) input to really broaden their horizons. There is nothing worse than a motivated group where a trainer cannot find a viable way to share their knowledge. By using good examples and one’s own experiences, you can definitely help to maximise the input and feedback from those involved. Repetition of key messages, explanation of difficult but important wording and good summaries all support the success of those involved. A strong connection to the group’s knowledge and experience is essential for the success of the training. The mission of good input from you as trainer when carrying out training is to find a viable way to deliver the most important and relevant content, to ensure the expectations and demands of the training are aligned with the experience level of the group in question. In a training program, it is the trainer who decides which exercises help to communicate the new knowledge in the best way. It is up to them to share it on a practical, doable level. One goal for participants is to experience those first steps with what has just been learned, to have experience in a safe environment with professional support. Often, participants can leave their comfort-zone while remaining in a safe environment which enables them to develop these newly learned skills immediately but without any added time pressure. An important factor is also to let participants try out new things within the training so they already have first experiences by the time they finish. This makes it more likely that participants will try these techniques again in the future and adapt the new knowledge and practices for each situation. It makes sense to do exercises where participants can acquire a meaningful connection between knowledge and usability too. Ideally, the exercises will be tailored to suit the needs of different participants in order to connect input with real, actionable experience. When dividing the group you can decide between a plenum, small groups, tandems or individual exercises. All have their advantages and disadvantages. However, I will offer one tip: for more sensitive topics it is better to use individual work or small groups. That way participants can decide themselves what to share afterwards in the plenum. The mission of good exercises in trainings is to let participants try out new ways of adapting the learned knowledge. It is important to not only make knowledge actionable but also to minimize the fear of trying it out. Good trainers find a healthy balance between leaving the comfort-zone and feeling safe at the same time. In training, the trainer has to support and embrace a reflection process to get a deeper understanding of the input and the systemic of exercises. It is crucial to reflect on the training to deepen the learning effect and to learn from shared experiences and viewpoints. Participants get the chance to see the topics from a bigger picture, from a different viewpoint or with additional insights. They get a better understanding about the systemic connections, the possible deductions as well as potential consequences. Including such reflection also means taking time to overthink one’s own actions and find adjustments and improvements for the next steps. It is a way of enabling participants to rethink their thoughts, readjust their beliefs and to go beyond any previous perceptions. Another tip is to facilitate the reflection process with powerful questions such as: “How has this exercise changed your understanding of the topic?” or “How impactful can your work become in the future when you are able to use method x for your job?”. In this way it is important to help participants reflect on their previous experiences, their new understanding and how they may benefit from it in the future. A good trainer facilitates reflection processes so that something meaningful and new can arise from it. The mission of good reflection in training is to connect previous experiences, new insights and viable approaches for self-development, personal improvement and a more meaningful way of life. Good training needs a well thought-through concept with variety and agility. 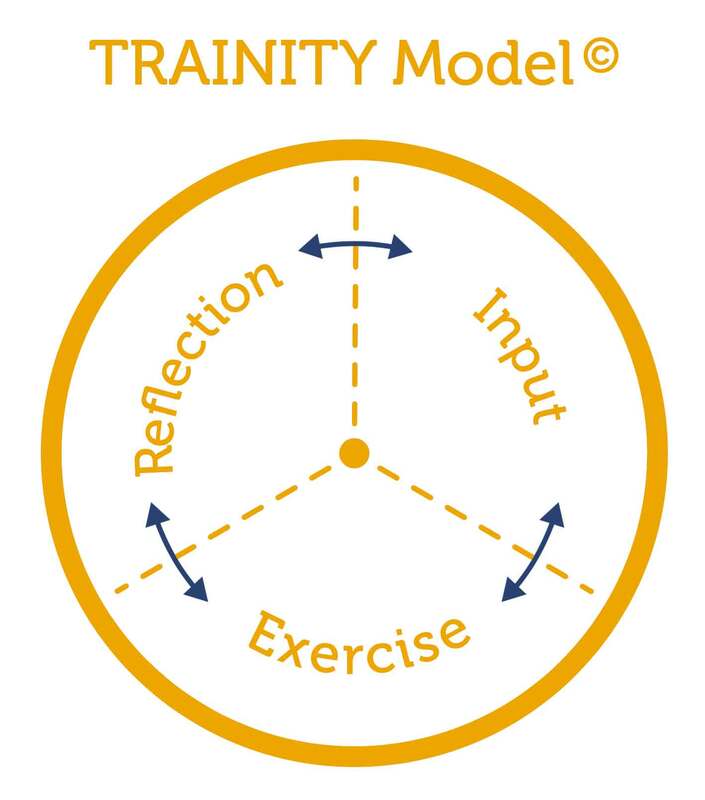 The TRAINITY Model can help trainers to conceptualize such good and meaningful training. It can remind trainers to implement all three aspects of training (input, exercises and reflection) as a standard approach. The TRAINITY Model is not linear. You do not have to follow it in one particular direction. The topic, time, participants and the context in which you create and execute your training will be reflected differently for each use case to offer the most viable solution. Using an agile approach to further develop the training after the first experiences (of the training sessions) it is the trainer’s duty to encourage reflection and gather feedback to continue improvement. With this you commit to quality, change-ability and the pursuit of your your own lifelong learning. As long as you are not violating copyright you can use the TRAINITY model for your own training. If you would like us to do a quality check based on the model get in touch!